Much has already been made of Canonical's forthcoming Ubuntu Linux 12.04 LTS, not least by Canonical founder Mark Shuttleworth himself, who has described it as the first time Ubuntu has taken the innovation lead over Macs and Windows. Now in beta, this new Ubuntu version--also known as “Precise Pangolin”--is perhaps most notable for its inclusion of the new, widely anticipated Head-Up Display (HUD) interface, which aims eventually to do away with menus. But while much of the buzz surrounding Ubuntu lately has focused on the desktop and other consumer-focused efforts--not just HUD but also Unity, Ubuntu TV, and Ubuntu for Android, for example--the Linux distribution is also making further inroads into the server world, Shuttleworth says. In fact, “12.04 LTS is a coming of age release for Ubuntu in the data center as much as it's the first LTS to sport the interface which was designed to span the full range of personal computing needs,” he wrote in a blog post on Wednesday. Underpinning that “coming of age” across platforms has been an increased focus on quality, Shuttleworth wrote. “We now have large-scale automated testing, improved upload processes, faster responses to issues that crop up inevitably during the development cycle, a broader base of users and contributors in the development release, and better engagements with the vendors who pre-install Ubuntu,” he explained. Also boosting Ubuntu on servers is that OpenStack has aligned releases of its Essex cloud software with Ubuntu's release schedule, Shuttleworth added. It's no real surprise to hear a company leader tout its products, of course. 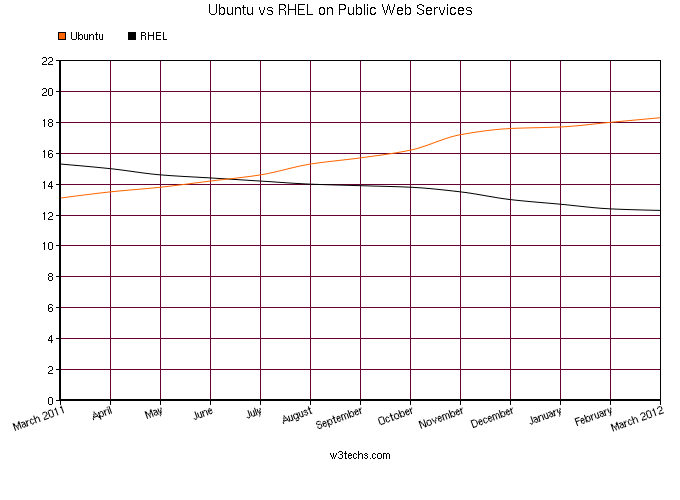 Recent data from W3Techs, however, does point to Ubuntu's growth on Web servers, as I noted earlier this year. Canonical's distribution passed Red Hat Enterprise Linux in usage on public Web services over the past year, Shuttleworth noted, as depicted in the graph at left. Ubuntu now ranks third among sites using Linux for Web servers, accounting for 18.4 percent of the websites that use Linux, according to W3Techs. Debian is in the lead with 30 percent, while CentOS is in the No. 2 spot with 28.9 percent. At. No. 4, Red Hat claims 12.2 percent, while No. 5 Fedora accounts for 5 percent.